Are you blessed? Can you provide for your family? Do you always have good meals? Do you have a nice house? Do you drive a nice car? Are you able to afford nice things? Can you go on fun vacations? Do you have a comfortable life? Are you blessed? The idea is ingrained into our culture that blessings equal comfort, wealth, material possessions, power, security, and happiness. We get these ideas from the world that surrounds us rather than from the Scriptures. Jesus painted a much different picture for us. Jesus, in his longest recorded sermon, redefined what being “blessed” means. What he said is shocking and counter-intuitive. The ultimate blessing that Jesus offers is the blessing of inheriting the Earth. Upon the resurrection, those who became part of God’s Kingdom will be blessed with eternal life and live on a renewed and restored Earth forever with God. Jesus, here in his Sermon on the Mount, claims that the meek are blessed. What does it mean to be meek? Meekness is not weakness, rather, it is power within control. Some translations use the word “gentle” instead of “meek”. The word in the Greek is “praus”. We see it used another time in the New Testament when describing the manner in which Jesus made his triumphal entry into Jerusalem on Palm Sunday (Matthew 21:5). Jesus was fulfilling Old Testament prophesy that the Messiah would come in peace and through peace. See, your king comes to you, righteous and victorious, gentle [praus] and riding on a donkey, I will take away the chariots from Ephraim and the warhorses from Jerusalem, and the battle bow will be broken. He will proclaim peace to the nations. Jesus could have rode into Jerusalem on a warhorse with the promise of a violent revolution to free the Jews from their terrorist oppressors, but he did not. Jesus showed us that gentle meekness is what inherits the land, not violence. Rome, who embodied the way of empire, did not inherit the land. Today the Roman empire is dead and gone, the way of violence destroyed it. One of the most shocking things that Jesus ever said is that the poor are blessed. When we think about being poor, we certainly don’t view it as being blessed. Our culture strives for wealth, or at the least, financial security. Being blessed is usually understood to mean that you have money in the bank for everything you need and also for the things you want. How can the poor be considered blessed? In the Old Testament, the word poor often referred to the economically destitute among God’s people who trusted in God as their only hope. In the parallel verse in Matthew’s Gospel the phrase “poor in spirit” is used while Luke just says “poor”. For Jesus, there really wasn’t much separating the ‘material’ from the ‘spiritual’. Jesus frequently pointed out that having wealth creates a barrier between us and God. Scripture often warns us that the love of money is something that can keep us outside of the Kingdom of God. (Luke 1:52-53, 16:13; Mark 10:23-25; Matthew 6:19-21, 16:26, 1 Timothy 6:9-11) Jesus plainly states that it is very difficult, if not impossible, for a rich person to enter into the Kingdom (Matthew 19:23-26). Money provides us with power, but not the type of power that Jesus wielded. Money provides us with comfort and makes us less reliant on God. Having lots of money creates an insatiable desire for more money. Jesus knew it would be a temptation for us and warns against it. Money gives us the ability to become our own gods. Seeking after more money isn’t necessary for citizens of the Kingdom because being poor is a blessing. Mercy is defined as “compassion or forgiveness shown toward someone whom it is within one’s power to punish or harm.” Scripture says that God is merciful to us. Romans 11:30 says, “you who were at one time disobedient to God have now received mercy.” Titus 3:5 says, “he saved us, not because of righteous things we had done, but because of his mercy.” All over Scripture we find that God has shown us mercy. Jesus here in his sermon is saying that in order to receive God’s mercy we must show mercy to others. Jesus says in this way we are blessed. We may have the power to harm or kill our enemies but Jesus requires that we show them mercy. Like meekness, mercy is is power within control. We may have the power to kill or dominate, but we resist the temptation, just like Jesus had to (Matthew 26:50-53). When Jesus told us to love our enemies he hoped that we would foster this merciful attitude which would allow for that type of love. Displaying mercy is a blessing for others and Jesus claims that we are blessed as well when we do. In our culture we believe there are multiple ways to bring peace. Our culture believes that peace can be achieved with violence. The life of Jesus proclaims that there is no way to peace, rather, peace is the way. Jesus rebuked the lie of redemptive violence (Matthew 26:52). Jesus showed us that peace is achieved through love and self-sacrifice. Jesus here makes his most radical teaching: love your enemies. There could be no more challenging demand, it goes against all of our common sensibilities. Shockingly, Jesus makes it a requisite for being saved. He says, “love your enemies” so “that you may be children of your Father in heaven.” Being a peacemaker and loving your enemies go hand in hand. It is how Jesus lived his life and it is what he did on the cross for us. Jesus redefined what being blessed looks like. We can take him as the authority of truth or we can dismiss him as naive and foolish. If we acknowledge him as describing true reality, it should cause us to pause and reexamine what we view as blessings. Even more challenging then that though is to consider the implications. If we look to Jesus as the ultimate example of how we should live our lives, we should be shocked. Jesus lived what he taught. He was meek, poor, merciful, a peacemaker, and he loved his enemies. To the naked eye it appeared that Jesus was a fool, and died a coward’s death. Scripture claims that Jesus came to bring the Kingdom of God to Earth, but he also came to die (Luke 4:43, 1 John 3:8). Jesus didn’t have to force the hands of the Romans or control the will of any man in order to achieve this. Just living the way of the Kingdom made those in power want him dead. He wasn’t the only one to die either. All but one of Christ’s disciples died by execution. They weren’t killed because they rose up and led a violent insurrection. They weren’t killed because they were fighting their enemies in order to achieve freedom. They were killed because they proclaimed a different way of life. They were killed because they claimed that true power is servanthood, humility, meekness, mercy, peace, and love. They were killed because they claimed that those at the top are actually at the bottom. They were killed because they gave their full allegiance to the Kingdom of God, leaving no allegiance left for the empire they lived in. Jesus and the apostles left an example of what being blessed actually looks like. It looks like gentle meekness, like mercy in the face of danger, like peace in a world of justified violence. It looks like washing feet and being a servant (John 13:14-17). In the end it looks like being tortured, ridiculed and crucified. This is the shocking truth of reality as defined by Jesus. The true King of Kings redefined what we naturally assume. He turned things upside-down. What the world views as a blessing can actually be a curse, and what the world views as a curse is actually a blessing. 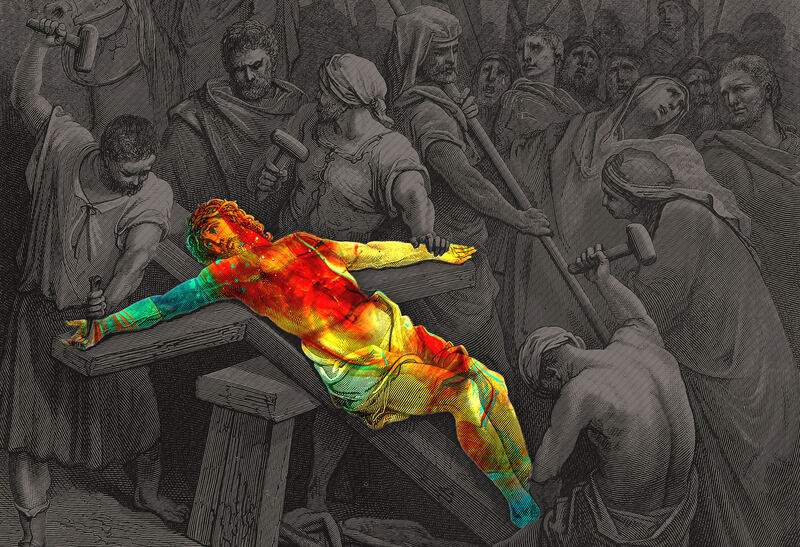 The execution of Jesus proved that truth is treason. It still is today. We can claim that he speaks truth, or we can ignore him. If we don’t chose one or the other with our words, our actions will reveal our heart.